Review by Neo: Andy Lau in 2007 has officially become a product placement in marketing terminology and a supporting actor in the HK film industry. Look no further than his ever existing presence in nearly every single MTR stations in HK and Kowloon, his every movement with that CYMA watch is noted as the busy and quick-paced HK work force steam pass without noticing every morning. In fact, it have become a piece of cliché that everyone have already gotten used to and making only former HK residents like Neo noticing it as he was holidaying in the small island during 2007-08 Xmas. When a reviewer begins a review talking about marketing and product placement, it usually comes with caution that the movie isn’t any good. While the good news is that Brothers isn�t outright bad, since it is average, on the bad side, there isn�t really that much to talk about. Perhaps the only piece realism that director Derek Chiu is able to inflict is quite frankly, Andy Lau and his CYMA watch, as both are probably the most memorable and real moment in the film. Without being a condemning critic, but to be honest, Neo is finding it extremely difficult to forget the moment that Andy Lau took his CYMA watch off and pretends to give it to Gordon Lam. Perhaps, it assists the current reviewer to bring back memories of the HK visit, but really Brothers is not a film about Andy Lau or his anonymous watch, rather yet another triad story. Back in 1991, there was The Tigers and there were 5 of them and moving on some 17 years later, only two and a half have gone on to better things. The first two is pretty damn obvious, as we need to look no further than mentioning the name of Andy Lau and Tony Leung Chiu Wai and the half is notably a resurrected TVB career in Miu Kiu-Wai. 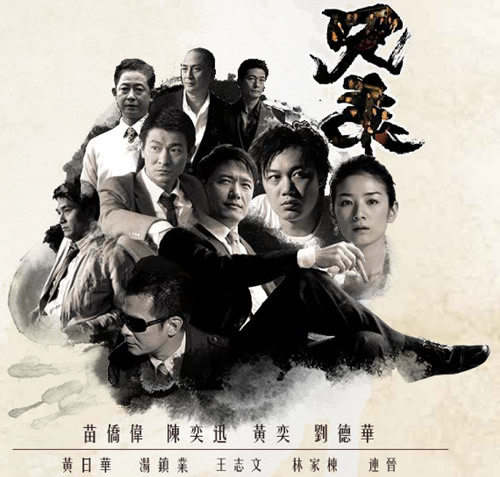 Without being slack, Felix Wong Yat-Wah and Ken Tong Chun-Yip does make an appearance as the good and the bad respectively in Brothers, but it seems more likely that both have disappeared from the spotlight for nearly a decade. Such is life as an Australian icon used to say (Ned Kelly is an outlaw if you didn’t realise), it just goes to show how much effort and luck people like Lau and Leung (and Miu Kiu-Wai to an extent) require staying in demand in the HK industry. In a rare starring film role for Miu Kiu Wai, he has more than enough presence to be a capable leading man, but there is no doubt that he is more suited to the small screen than the silver screen. Let’s not forget that the film contain someone called Eason Chan, who may seem to be miscast, somehow managed to look more convincing than the rest of the cast. Neo have always claim that Chan is an actor filled with unlimited potential ever since his dramatic performance in Funeral March and since then have gone on to prove the current reviewer correct in flicks like Love Battlefield and Crazy N the City and last year’s critically acclaimed The Pye Dog. His expression when he first shot someone is certain priceless to note and a stark contrast to the stoic and emotionless Wong Yat Wah and Miu Kiu-Wai to an extent. Special mention must also be made to the most required eye candy in Crystal Huang Yi. While Neo is bias when it comes to pretty faces, but she does light up some of the pretty cliché proceedings, though a criminal lawyer as pretty as Huang is might actually take some convincing. Andy Lau also appears here and there in his post-Infernal Affairs role as a cop who seems to worry more about his CYMA watch and his stylish suit than anything else. With that being said, Brothers is by no means an outright bad film, but it is just a genre film that takes no new risks and no new turns. The result is an efficient, emotionless and ultimately flat head average flick that never seems to attempt to rise above genre conventions. Director Chiu have the backing of Andy Lau, and it is a shame that he can not get more out of his established cast and it doesn�t help when the ending is more cheesy than it should be. In what should have been an emotional final sequence, Chiu misses the mark and perhaps also due to the stoic role of Miu Kui Wai, the audience never feels for the lead and the effect is a feeling of distance than relating.